If you’re looking for the best studio monitor controller for your home studio, there are a few safe and recommended options to choose from. We’ll go over them, as well as discuss what a monitor controller is, and how you should choose one. Quick answer: the top recommended controller is the PreSonus Monitor Station, which has many useful features, connections, and for a good price. But if you’re looking or something simple, as well as low-cost, take a look at the Mackie BIG KNOB, which tends to be highly recommended among producers. The rest of this guide covers a couple more options for your inclination, as well as go into a few of the important features you need to look out for. … to better improve your workflow. The main way they do this is to allow you to ergonomically control your monitor’s volume by a simple knob, which is much better than relying on your mouse and clicking and dragging a fader on your screen. And because your volume control is independent of your DAW’s mixer, it prevents you from rendering quiet mixes, since you can leave your DAW’s master fader at 0 dB (which is ideal). If you have a small setup with headphones a laptop, and a pair of studio monitors that you use for mixing and producing music, a simple monitor controller would be a good option for you. But because studio monitor controllers (also called “studio monitor management systems”, or simply “volume controller”) give you the ability to control the volumes of your monitors independent of your computer’s soundcard, you can scale your workflow to manage multiple sound outputs (monitors) while mixing and editing in the studio. For instance, if you know that you’ll need to expand to add a subwoofer, a cube-style mid-range monitor, or switch between mono to surround sound, then a monitor controller that has more output controls and switching functionality is your best bet. Many monitor controllers also give you the ability to connect multiple inputs that you need to monitor. This is great for cases when you need to monitor not just your DAW or audio interface’s output, but also another instrument line or microphone separate from your other gear. This, like I mentioned at the top, improves your workflow in leaps and bounds as your studio expands. 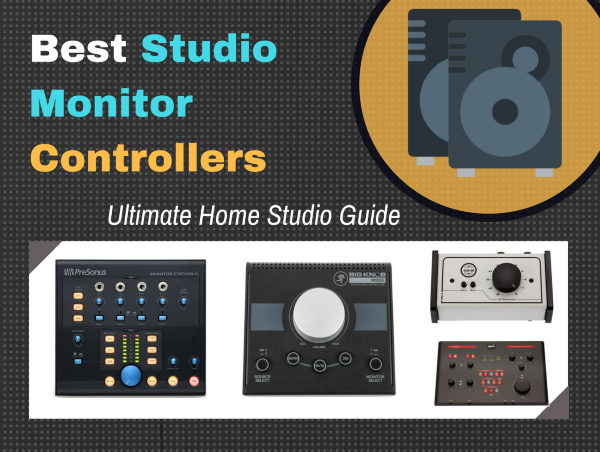 So with that said, let’s take a look at some of the best studio monitor controllers to get. 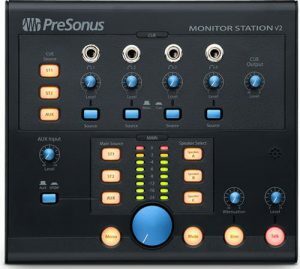 The PreSonus Monitor Station is a good value-for-money controller for a mixing engineer and music producer. And it’s the most user-friendly one in its price range, even with all of its features. For an advancing music producer or recording and mixing engineer, the PreSonus monitor controller is an good choice. Satisfied customers point to the importance of having 3 outputs, as opposed to many other units with only 2. The extra output allows for the use of multiple headphones and other audio equipment. Currently with little to no critical reviews, the Presonus monitor controller remains at the top tier in its price range. 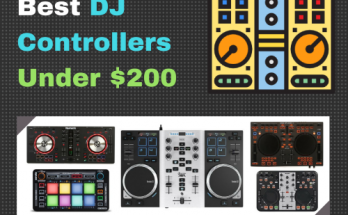 Although it’s not the cheapest on the list, this studio monitor controller could debatably be at the top of the list for some due to its professional quality build. Read the customer impressions on Amazon. The Mackie Big Knob studio monitor controller is a very well sought after beginner studio monitor controller. “Beginner” in this sense that it is super simple and straightforward in design. Studio monitor controllers are different from other pieces of equipment in that a professional can still get by with a beginner studio monitor controller. This is simply because a professional might use less audio outputs, rendering a super expensive monitor controller useless or overkill. That said, there are also options in the Mackie Big Knob line for more connections for a large studio setup. The Mackie Big Knob studio monitor takes a super easy-to-learn user interface and (given the name) a massive center control knob to make the ultimate studio monitor controller. Since it’s such a low-cost device, there are a few features that you might miss out on. But it’s nothing if you simply wanted something to control the volume of your monitors. 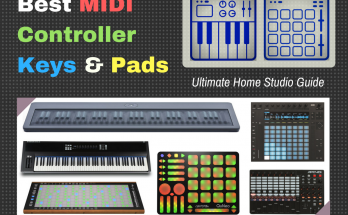 Some critical reviews point to the fact that there are no MIDI inputs or outputs, which can be an instant denial for some buyers. The lack of MIDI sockets makes it nearly impossible to use some devices without special adapters. All things considered, the Mackie Big Knob is actually a pretty decent setup. From simple, family and friend recording projects to full on professional audio recordings, this studio monitor controller really is worth the small investment to many of its satisfied customers. 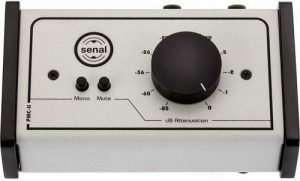 The Senal PMC-II studio monitor controller is one of the best cheap studio monitor controllers around. Its compact design gets straight to the point and avoids any confusing labels. With 2 XLR inputs/outputs, and 1 stereo ¼” input/output jack, you’ll have everything you need to get started recording. Although you don’t get all the fancy extra features of the more expensive studio monitor controllers on this list, you still get a quality and easy-to-use unit. Happy customers love the strong design, which doesn’t come with most other monitor controllers in its price range. For under $100, this monitor controller is one of a kind. If you’re looking for a studio monitor controller that isn’t too confusing without all sorts of buttons, check out the Senal PMC-II. This unit is perfect for anyone mixing in the studio who wants to keep their equipment to a minimum while still maintaining control. Just select up to 3 inputs and outputs, and it’s all plug and play from there. The SPL Crimson Monitor Controller is one of the most all-inclusive controllers on the market. At 8.2 x 2.4 x 13 inches, it doesn’t take up too much space in the studio at all. If you’re looking to mix multiple audio outlets at a high quality, the SPL Crimson offers 10 source connections and 20 monitoring channels. Although the SPL Crimson monitor controller is the most expensive controller on the list, it offers many features that help it arrive at the top, like the on-board USB interface. With a high-durability, long-lasting construction, this studio monitor controller really pulls its weight. 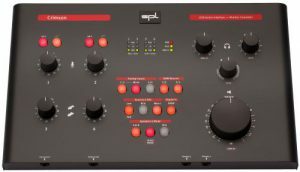 If you’re looking for a high-end, professional studio monitor controller, the SPL Crimson is definitely worth a look. Its only critical reviews reference the high price point, which is expected with such a high quality product. Despite this critique, its consumers still remain satisfied with the results. For a recording studio engineer or producer just starting out, this monitor controller might be a little overkill. There are several other options on the list to suit your current situation. That being said, the SPL Crimson monitor controller is meant for a professional, or someone working to that sort of level. Studio monitor controllers can be a very useful piece of studio equipment, even if you’re just focusing on the essential studio gear. If not simply for the headache relief of managing many monitors, or an ergonomic volume control, it’s a safe method of keeping all your sound outputs in line. Constantly adjusting multiple speakers, headphones, and sound systems can be a huge avoidable hassle. Once you’re ready to start looking at studio monitor controllers, you need to write out your needs. How many audio sources do you have? Will you want to expand in the future? These sorts of questions will help in determining which one is right for you. Which studio monitor controller is right for you? 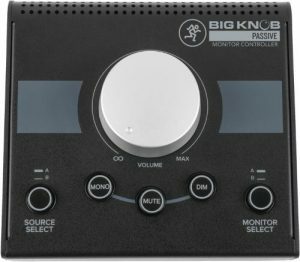 If you’re looking for a beginner, multi-outlet passive monitor controller, you’re best bet is probably the Mackie Big Knob or the Senal PMC-II depending on your setup. If you only need a pair of XLR connectors for in/out, then the Senal PMC-II is the right choice for you. If you’re looking to use a lot of monitor cables with ¼” jacks, then the Mackie Big Knob offers a few more options. For a higher quality, more professional interface with far more features, check out the SPL Crimson High Performance Studio Monitor Controller. You get all the audio outlets you need, including USB ports. Although it’s on the more expensive side, you get what you pay for in the build. Music producers on a budget but who are still looking for professional quality should consider the PreSonus Studio Monitor Controller. With a more compact build, you still get a high quality and durable product but without the price tag of the SPL Crimson controller. However, you do lose out on the massive array of audio outputs/inputs. In the end, studio monitor controllers are a very usable, and sometimes necessary piece to your audio equipment setup. By now, you probably understand how important of a role they play in production management. When should you consider studio monitor controllers? You want a better way to control your monitor’s volume instead of using your computer’s fader. You have multi of monitors, like you’ve added a subwoofer, or a cube-style monitor for isolating the mid-range, which need a central level control. You want to monitor more than just your DAW’s output, like a CD player or an instrumental output. You want to quickly transition mixing in mono to 5.1+ surround sound. You need to cue mixes during recording sessions by having control of the monitor headphones in the recording room, not just the monitors in the control room. What other features do monitor controllers offer? One important feature is the ability to set the low end of frequencies and adjust the subwoofers. When mixing with several outputs, it’s very important to be able to control frequencies. Otherwise, your audio could sound different outside of the studio. Also, in addition to the built-in talkback mics, some monitor controllers also have built-in microphone and instrument preamps. This can be very useful for monitoring other sound sources where you need to minimize your gear. Are studio monitor controllers worth the investment? Monitor controllers may seem like just another piece of gear that’s not producing sound. But they begin to pay for themselves when your workflow is not interrupted by manual monitor switching, or by incorrect monitoring levels across devices. If you feel your workflow could you some improvement, it’s certainly a recommendation.